Kids are energetic, can be chaotic and are often messy, and Yoplait believes in championing this – not fighting it! Yoplait Petit Miam's range of squeezable yoghurt pouches are designed to fuel growing bodies with nutritious goodness, in tastes they'll love. Yoplait Australia's delicious range of Petit Miam yoghurt pouches now contain 30% less sugar than the average flavoured yoghurt, with no artificial colours, flavours or preservatives. The range is made with real fruit and vegetables, and the goodness of tasty, Australian milk sourced from dairy farmers across the country. The unique combination of quality ingredients creates a delicious fresh taste that kids will love. Nutritionist Skye Swaney has partnered with Yoplait Petit Miam to spread the word about the important role dairy plays in growing bodies. "Yoghurt pouches offer an easy and delicious way to provide your kids with adequate calcium, an essential nutrient for growth and development." "As a mother myself, I know how important it is to parents that the food they're feeding their children is not only healthy, but also convenient to fit in with their family's busy schedule. Yoghurt pouches offer a quick, convenient and healthy snack choice for the little ones and I'm delighted to partner with Yoplait Petit Miam to help spread the word!" Whether you're looking for travel snacks, picnic packs or on-the-go chaos controllers – Yoplait Petit Miam pouches will keep tummies full and busy hands quiet. Darryn Wallace, Marketing and Innovation Director, Lion Dairy & Drinks said Yoplait Australia was excited to deliver a healthy yoghurt offering to young Aussie kids, with 30% less sugar than the average flavoured yoghurt. "We recognise that on-the-go kids need healthy snacks, but it can be a struggle for parents to find healthy options. Parents and children are constantly on the go and it's important that kids are fueling their busy lives with nutritious snacks. "As part of our business, we're committed to Our Goodness Promise, putting nutrition at the heart of everything we do and delivering more natural goodness to children across Australia." 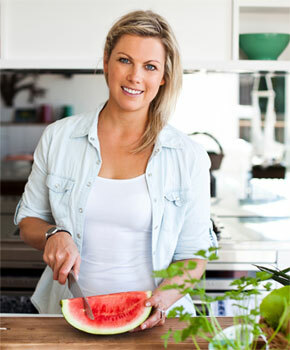 Skye Swaney is a children's dietitian and nutritionist and founder of Shift Nutrition, based in Sydney, Australia. Skye has partnered with Yoplait Petit Miam to spread the word that the Petit Miam range contains 30% less sugar than the average flavoured yoghurt and is a convenient, healthy and delicious snack option for families. Question: What do you love about the new range of Yoplait Petit Miam? Skye Swaney: It can be a real challenge for parents to find healthy snacks without lots of added sugar that kids will actually eat, so I love that this range has 30% less sugar than the average flavoured yoghurt*. They're also a really manageable size and are a great source of calcium and most importantly, kids love them! Question: Which is your family's favourite flavour? Skye Swaney: My favourite is blueberry but my 1 year old is a big fan of plain! Question: Why is it that kids prefer a squeezable pouch? Skye Swaney: Pouches allow children to eat on the go, which is a big plus for active kids who don't want to stop for snacks during the day. For little ones who aren't yet ready to use a spoon, pouches allow them to feed themselves rather than having an adult do it, which is a huge novelty! Question: How is the new range family friendly especially for busy mums? Skye Swaney: The pouches are a really convenient snack to pop in your kids' lunch bag as you head out so that you know you've got something healthy on hand that your kids will actually eat. Question: What inspired your passion for children's nutrition? Skye Swaney: I love the idea that you can influence someone's health for the rest of their life by teaching them good habits when they're young. What we eat has such a huge influence on not just our health, but our whole enjoyment of life, so I think it's so important that children learn to appreciate and enjoy healthy food early on. Question: What nutrients are most young children lacking? Skye Swaney: A lot of kids aren't eating enough fruit and vegetables which mean that they're missing out on adequate amounts of fibre and vitamins and minerals. We're also seeing a lot of Aussie kids missing out on calcium as they get older. Dairy is the richest source of calcium in the Australian diet so making sure kids are eating enough dairy foods, whether it is milk, yoghurt or cheese is really important. Question: What are the five essential nutrients we need to include in our children's diets? Skye Swaney: Any nutrient the body can't produce on its own is considered an 'essential' nutrient, so protein, carbohydrate, fat, vitamins and minerals are all essential nutrients that are needed in children's diets. Question: Can you share your top five family-friendly snacks? Skye Swaney: Fruit, veggie sticks with hummus or nut butter (if at home), yoghurt, wholegrain crackers with cheese and popcorn are all easy, healthy snacks which are popular with kids (and adults!). If you're struggling to convince kids to get excited about these healthy snack options, try cutting fruit and veggies into shapes or making fruit kebabs, adding a little dried fruit to popcorn or freezing yoghurt in ice cube trays or in their pouches to make instant frozen yoghurt!